Note: As usual in about a week, I will have this article shown in VB 9.0 code. So check back later. In Part 1 we built a very simple, flicker-free, frame-less, web chat application using ASP.Net 3.5, LINQ-to-SQL, AJAX and MS SQL Server, with your choice of either C# 3.5 or VB 9.0 in about 2 hours. As promised, we will add functionality to our previous chatroom application so that users will have the ability to chat with each other privately. You can read and download the code of Part 1 in C# 3.5 here, or in VB 9.0 here. Here's a snapshot of the Chatroom area. We will need a table to hold information regarding users that sends invitations to other chatters, so they can chat privately. 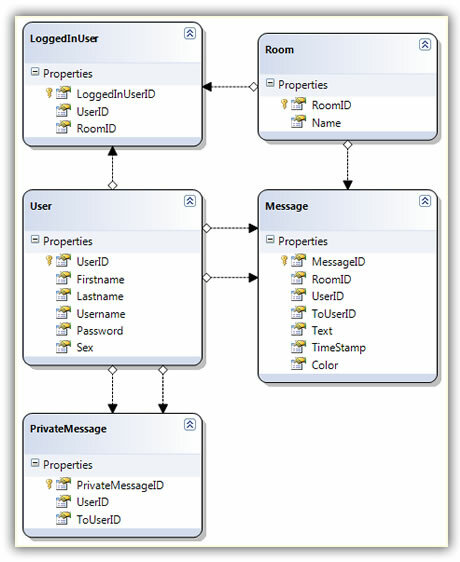 As shown below, I added a table called PrivateMessage. There are several things that happens when we send someone an invitation to chat privately. To send an invitation, we first need to send a message to the other chatter on the newly popped-up window (ChatWindow.aspx), just like other chat applications out there. When you send a message to let's say "John Doe" from this window for the very first time, information is saved in the PrivateMessage table. So, just to make it clear, all messages sent after the first one to "John Doe" will not be saved in the PrivateMessage table. The information saved in the PrivateMessage table is then retrieved from the main chatroom page (Chatroom.aspx) every seven (7) seconds or whenever you hit the send button, checking if another user(s) have sent you an invitation to chat privately. 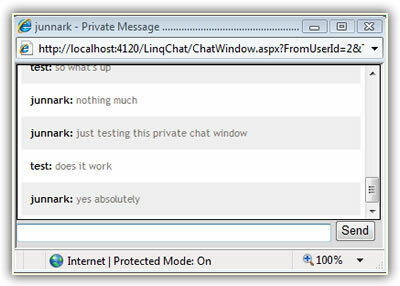 If an entry is found, the hidden panel server control's visible attribute is then set to "true", showing the invitation to chat privately. As usual, I was in a hurry to finish this code. One suggestion would be, when the user clicks the Cancel button, send the other user who sent the invitation a message saying that you declined the invitation to chat privately. This can easily be done on the Cancel button's click event. Maybe I'll add this in Part 3. In Part 1 we focused the Send button by setting the defaultbutton attribute of the form tag to the ID of the Send button. This made a continous focus on the Send button so that when we hit the "Enter key" on our keyboard, the message is sent, there's no need to manually click the Send button with your mouse to send a message. Interestingly enough, we cannot do this when another window opens up as a child or children window because the focus will keep returning back to the parent window. Or if we also set the defaultbutton attribute of the form tag to the ID of the Send button in the child window (ChatWindow.aspx), the focus will go back and forth from the Chatroom.aspx to the ChatWindow.aspx, and vice versa. The window will refocus the Send button, therefore focusing back on the window itself every single time there's a post back. The post back occurs every 7 seconds on the timer tick event. The parent and child windows share Sessions. You will notice in Part 1 that if you open two or more instances of the Chatroom.aspx window, the focus does not go back and fort these windows even though the defaultbutton attribute is set for the Send button. This is because the windows are instances of the browser, and therefore does not share Session with each other. Shown below is the reusable method that we will call to set the focus from different events in our code. Why is the code longer in the ChatWindow.aspx code file? Because we're assuming that each Chatroom.aspx that is open are separate instances of the browser, therefore, each Chatroom.aspx window that is open only need one marker, "MainWindow". On the other hand, each ChatWindow.aspx that is open shares the same Session as the parent, and are not a separate instances of the browser, this is why we need to know which of these ChatWindows is supposed to receive the focus. Every single time a window loads, or opens, whether it be the Chatroom.aspx or the ChatWindow.aspx, we need to set the focus on the Page Load event under the !IsPostBack validation. In the OnClick event of the Send button. Both Chatroom.aspx and ChatWindow.aspx code file have similar code here. In the tick event of the Timer Control. And lastly, in the onclick event of the Message TextBox control. The only catch here is that; the Message Text Box control does not have a server side onclick event. So we'll have to do this from the client-side, and from the client, we will call a server-side method. In Part 1, we implemented a callback feature so that when a chatter closes his browser, we're still able to log that user out by catching a client-side event that calls to a server-side method, where the actual logging out is done. We will do a similar code here. Here's the client-side function that is called from the onclick event of the Text Box control. Notice that it's calling another method. This is a call-back method called asynchronously with the client-side function, which we will wire-up from the server side. In the code file (code-behind), because we're implementing the ICallbackEventHandler (see Part 1 for explanation), we can easily register scripts for the call back functionality. Now, the magic happens in the ICallbackEventHandler's RaiseCallbackEvent method. The control was passed here when we called the FocusThisWindowCallBack('FocusThisWindow') from the client-side. The "eventArgument" works as as comma-delimited string variable, so if you passed more than one string as a parameter from the client-side function, all will be caught by this variable. Note that all callback methods from the client-side will pass through the RaiseCallbackEvent. With that said, in Part 1, we did not pass any parameter(s) from the Log Out callback method, because there's only one method that will pass through here. But now both the Log Out and the Message Text Box control's client-side onclick event will use the RaiseCallbackEvent. In short, we will differentiate who did the call back by checking the eventArgument's value. 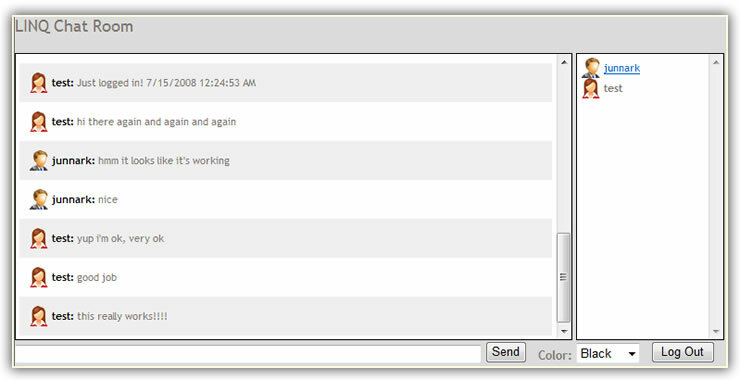 289         /// We're doing 2 things here now so we want to validate whether we're trying to "LogOut" or "FocusThisWindow"
Adding features to this web chat application using ASP.Net 3.5, LINQ-to-SQL, and ASP.Net AJAX surely made coding a whole lot faster, and therefore fun. Adding this private imming or chatting functionality took about an hour to complete. Doing this in ASP.Net 2.0 would have taken at least 3 times longer to complete. So kudos to the ASP.Net team. I'm planning to write a Part 3, but I'm not sure what to write about or what functionalities to add, so if you have any idea of the functionalities that I can add, please email me.